The Karen National Union (KNU) chairman General Mutu Sae Poe said the nationwide ceasefire agreement (NCA) was signed to solve political problems by political means and it was not to abandon the way of arms. He said this in his address to the 69th Karen National Revolutionary Day on January 31. “The KNU has thought and performed by putting at the forefront peace and prosperity for the entire people and the development of the Union State. It is not categorically for abandoning the way of arms. It is for the establishment of a new political culture in which the political conflicts are not resolved by violence but by holding discussions politically and resolving conflicts by peaceful means, through consultations,” said the KNU chairman. He was responding to the criticisms made by some Karen nationals and political analysts from in-country and abroad on the current peace process which is being implemented by ethnic armed organizations (EAOs) including the KNU and the government. They claimed that the peace process is the path to abandon the way of arms and it cannot achieve genuine peace since it is being implemented in line with the 2008 Constitution and the six-point policy of the Tatmadaw Commander-in-Chief. 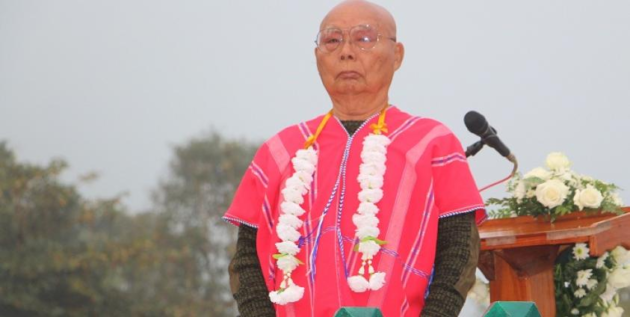 A ceremony marking the 69th anniversary of the Karen Revolutionary Day was held at the KNU-controlled area in Law Khee Lar of Hpa-an District on January 31. During the ceremony, the KNU vice-chairman P’doh Saw Kwe Htoo Win told Karen News that the current ceasefire has not stopped the revolutionary movement and arms are held to protect the political position. “Besides agreeing on the NCA, the six-point policy of the Tatmadaw is being upheld. There is also the 2008 Constitution. If they (the EAOs) continue like this……..they (the Tatmadaw) are now saying that DDR (Disarmament, demobilisation and reintegration) [needs to be implemented] in order to have only one Tatmadaw. It is a way of laying down arms for the EAOs to set up a political party and enter the parliament if they want to do politics, do business if they don’t want to do politics, or live as civilians if they don’t want to do business. We believe this is not the expectation of the revolutionary way,” said Mahn Orlando, executive committee member of the International Karen Organization (IKO). In his address, the KNU chairman said they have to find solutions by peaceful means on the misunderstanding and opposing views on the NCA. He urged everyone to assist from their own respective corners in order to support the political dialogue and the struggle by peaceful means running smoothly. “As we have supported, with courage and all our might, the armed struggle of the KNU, there is cause for us to support and work together at a time like this, when we are making the effort by political means and dialogue,” he added. The KNU signed the state-level preliminary ceasefire in Hpa-an, Karen State on February 12, 2012. The KNU joined seven EAOs in signing the NCA with U Thein Sein administration on October 15, 2015. The KNU has been criticized by Karen nationals for not obtaining any political agreement with a guarantee within three years after signing the NCA. During the emergency meeting held on January 5, the Karen National Liberation Army (KNLA) announced its refusal to accept the Tatmadaw’s intention to disarm the EAOs and have them establish political parties to run in the election or live as civilians. Since starting the Karen revolution in 1949, the KNU met with consecutive governments for less than five times, but the dialogues fell through after it was pressured to surrender arms and enter the legal fold, according the KNU’s historical record. Eight EAOs signed the NCA, which was implemented by U Thein Sein administration. After meeting with the State Counsellor Daw Aung San Suu Kyi and the Tatmadaw Commander-in-Chief Senior General Min Aung Hlaing in Naypyidaw on January 23, the New Mon State Party (NMSP) and the Lahu Democratic Union (LDU), which are members of the United Nationalities Federal Council (UNFC), announced their plan to sign the NCA.